It seems like the things that I crave most are the items that I should not eat. A dairy-free diet can be so tough to follow as dairy is in almost everything. Since I have been dairy-free for only six months, I still miss a lot of my favorite foods. The one that I miss the most is chocolate and it was a sad Christmas and I got no gifts of chocolate. I have yet to find a candy shop in town that sells vegan chocolate or dairy-free candies. Since eliminating dairy from my diet, I am more aware of my symptoms when I eat dairy. Yes, there are many days that I am in denial about my dairy allergy and I will eat something with milk in it and later that day I regret it. I tell my kids that it is OK for me to have a sugar cookie with frosting and it will be worth the nagging cough. So like the other day when I had a free coupon for a sweet at Panera, I gave into dairy. Later that night the asthma cough started and the next morning, I had a bunch of mucus in my throat. Sometimes, I don't eat dairy on purpose and order food from places thinking that it will be fine. I thought that the eggs would be cooked in oil or that the non-dairy coffee creamer would be OK but when nausea set in later I knew that I was wrong. Calling it "non-dairy" isn't always true. You would think that a product called "non-dairy" would be safe for those who avoid dairy in their diet, right? But vegans and those with lactose intolerance or a milk allergy be warned: While many non-dairy creamers contain no lactose - the sugar found in milk that many have a hard time digesting - those same products may still contain casein. Casein is a milk protein that can trigger reactions in those with milk allergies. It gets added to non-dairy creamer to impart a milky flavor and texture. Labels must list casein as a milk product in the ingredient information box. So, while the label may say "non-dairy" or "lactose-free," it does not mean it contains no dairy-derived ingredients. Dates dipped in sea salt taste so delicious! So I have learned that I need to make my own dairy-free treats if I want to avoid feeling nauseated or have troubles breathing. I also bring my own coffee mug to my church that is prefilled with almond milk and stevia so I can fill it with coffee. I even pack or buy almond milk when traveling as most hotels only have those dreadful "non-dairy creamers" that have casein in them. I have learned to read ingredients and so have my boys as they remember how sick their mom was last year. They remember me not being able to read a bedtime story to them without having a coughing attack that left me gasping for air. 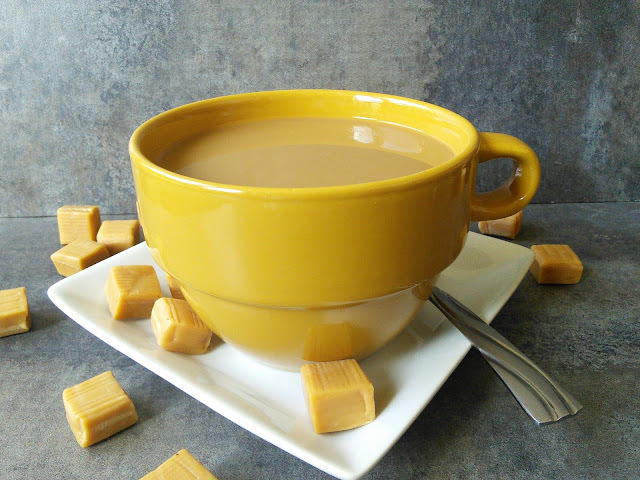 So I am glad that I discovered a way to make dairy-free caramels. It is hard to believe that a dairy-free treat that is made from dates and peanut butter can taste like real caramel but they do. These delicious vegan candies are also so soft straight from the freezer. These treats are guilt-free so I can enjoy more than one! Soak the dates in hot water for 15 minutes. Drain the water. Then line a loaf pan with parchment paper and set aside. Place the soaked dates and all the rest of the ingredients, except the flaky sea salt, into a food processor. Blend until smooth. Spread the mixture into the prepared loaf pan and freeze for 60 minutes. 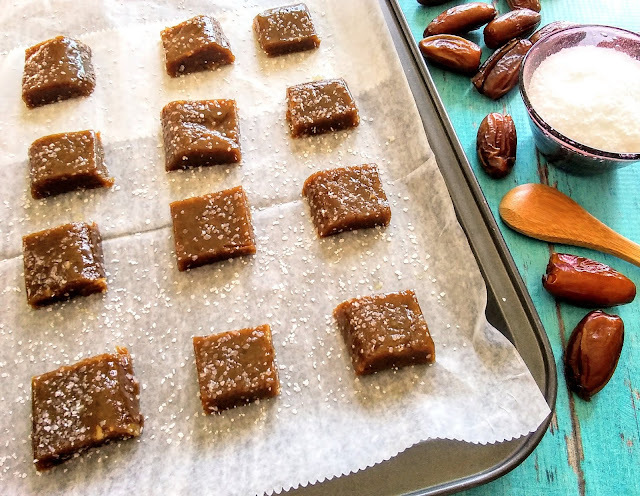 Once frozen, slice the caramels into 1-inch squares and sprinkle with the flaky sea salt. Store the caramels in an airtight container in the freezer up to a week. 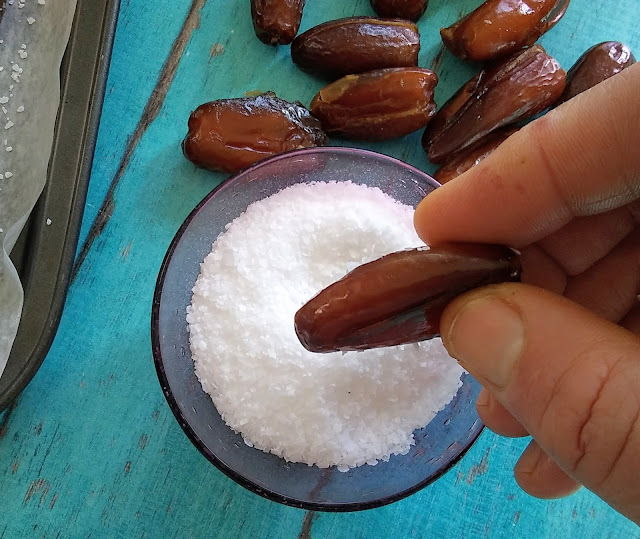 These look super yummy, I have never tried dates in salt I need to do it soon. The salt brings out the sweet just like salt does to chocolate. It sounds like you are managing to get around your diary intolerance and make your own sweets. This recipe sounds healthy and delicious. These look soooo delicious and very easy to prepare, will give it a shot this weekend for sure. Thank you so much. These look tasty! I am a big fan of caramel, so I bet I'd like these. My daughter might even enjoy them too! It comforts me that I am not the only one who has milk allergies and asthma. It is good to have kids who care about us. This sounds like something worth trying. They look and sound delicious. What a clever combination. 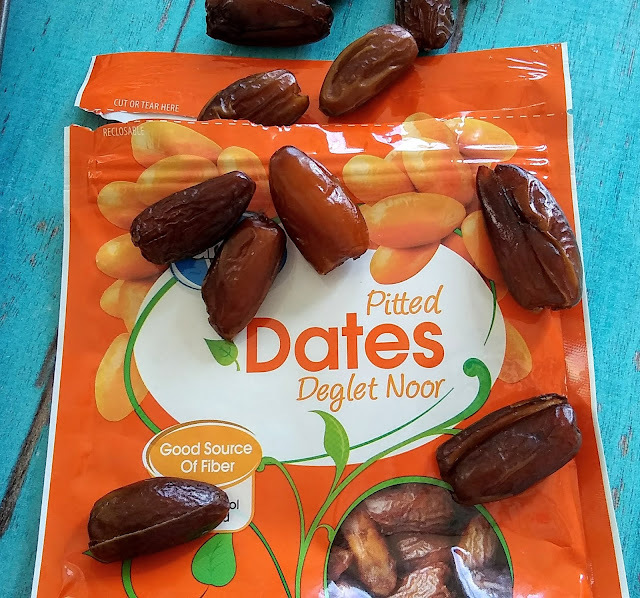 I like dates but not too many as they can be very sweet but mixing them with peanut butter is such a novel idea or even dipping them in sea salt. I am blown away by the simplicity of this recipe. These salted caramels look so delicious! I really love that they are dairy free as well and think this is a really great sweet treat to make with my daughter over the weekend. This look really delicious. Good luck with your dairy allergy, it must be tough finding new things to replace your favourite foods. Looks mouthwatering , love to have them. Thanks for sharing this blog. Yum never tried dates in salted caramel such a unique recipe. I will have to give it a try. Dates and salt really? This is innovative. I love sweets but on the other side of the spectrum I'm also anything salty. This combination is worth a try. Thanks. Always love to read healthier version of irresistible treats! These are perfect to pair with tea I could imagine. Whoa! You really have done it! Six months without dairy is just commendable!But it's nice that you're getting more healthy eats. Oh my gosh! This date salted caramels looks so good!!! I have to try and make them myself.